You know how it goes: an ingredient is all the rage, you can’t turn a supplement page without it glaring you in the face, you went to a dinner party last weekend where the (irritatingly talented) hostess used it to great effect, and now you’ve bought some. But there’s, like, loads of it. 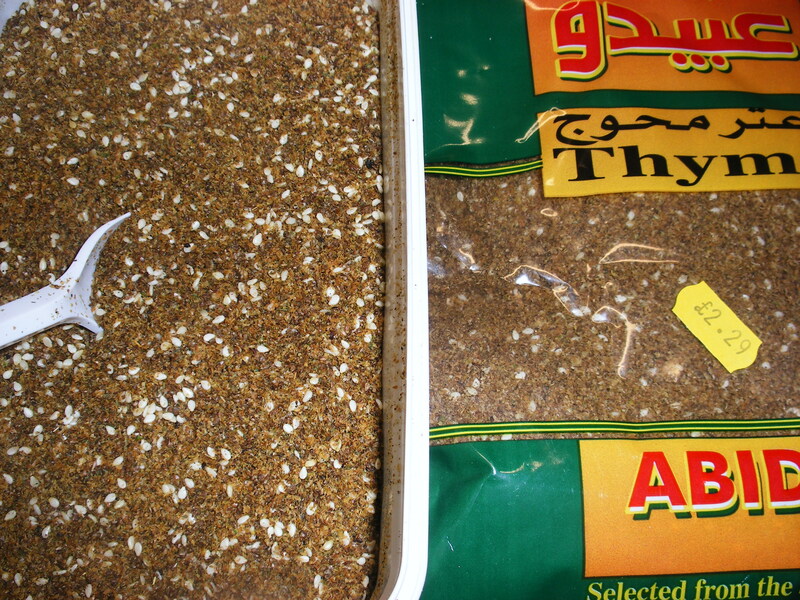 This week’s ingredient du jour is za’atar: a moreish mix of ground wild thyme with sumac, sesame and salt. Your pet Persian corner shop is so cheap that you get half a kilo of the stuff for just £2.29. You’ve used a bit here and there: what to do with the rest…? 8) Whisk into an olive oil and lemon based salad dressing with some fresh chopped garlic. Leave half an hour to macerate. Drizzle over Mediterranean style salads. 7) Add to mayonnaise for a fancy dip on party buffet tables – works really well with kibbeh and falafel. 6) Za’atar ‘tea’. Oh yes. All of its ingredients have strongly healing properties. Even the sesame bit works well in tea. Thyme is a famous cold remedy (it is an expectorant and anti bacterial), and the slightly astringent qualities of sumac mean it is full of vitamin C and good for sore throats. Even the salt will help. Now obviously you can’t go adding sugar to this: it is a savoury decoction. But sip it slowly and you’ll find the slightly weird flavour grows on you. 5) Use with fish. Mix a goodly amount with a dash of olive oil and garlic; rub half of it inside the fish, them make a few small incisions in the skin of the fish and poke the rest into these cavities. Grill the fish and serve with a tahini sauce. Really really tasty stuff. 4) Za’atar is practically made for roast chicken. Just rub it on all over and cook as normal. You can add a bit to your roast tatties and all. 3) Make za’atar pancakes: whisk 1 tablespoon plain flour with 1 egg and as much milk (cow, soya, what you will) as it takes to make a thick-but-pourable batter. Mix in 2 heaped teaspoons of za’atar, and cook the pancakes in a little oil one side only. Fry off some chopped mushrooms in garlic butter. Grill the top side of the pancake until it just starts to cook, and then sprinkle with grated halloumi. Grill them a bit more till bubbling and golden, and then tip on to plates, cheese side up. Stripe each one with some mushrooms, and a big handful of fresh herbs (tarragon is especially good here), roll and enjoy. 2) Anyone who has read Veggiestan or Snackistan will know that we have a thing about using up stale bread. Add a bit of za’atar to some fried bread and you get the world’s best croutons for soups and salad. 1) Za’atar Crisps and Nuts. You read it here first. Finely slice potatoes, or turnips, or soaked (drained) chick peas, or raw almonds, or whatever. Dip them in za’atar infused olive oil and bake in the oven until crispy/browned. Awfully good. And there you go. You’ll get through that bumper bag in no time.